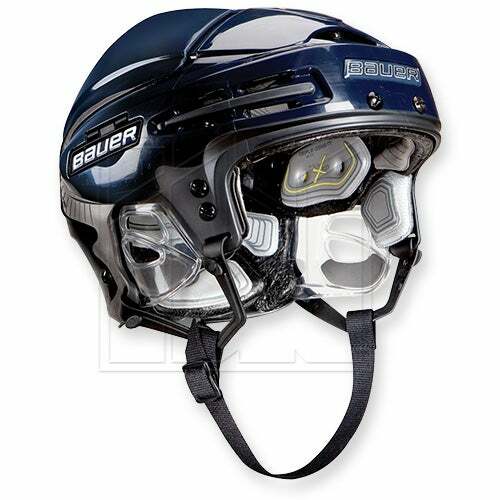 Bauer has released their latest and greatest hockey helmet the Bauer 9900 helmet. Bauer has taken the design of the 9500 and brought it to the next level. Although, the shell remains the same Bauer has re-worked the inside offering a great new fit. The 9900 offers a deeper fit than the previous 9500 helmet. Bauer has also introduced a new type of material they are calling PORON® XRD foam which is used at two spots on each side of the head in the high-impact area. This material is extremely light, breathable, and flexible making it perfect for hockey. According to Bauer the PORON® foam dissipates more than 90% of force on impacts. This material is used along with FXPP foam, and slow memory comfort foam. The FXPP foam dissipates 20% less energy than standard EPP foams. The slow memory foam offer a great comfortable fit. Basically they have your comfort and protection covered with the combination of these high-end foams. This entry was posted in Other Hockey Gear Reviews and tagged Bauer 9900 Helmet, bauer helmet, hockey helmet remove, new bauer helmet on March 26, 2010 by Tyson.